Alcea Quartet becomes BL!NDMAN Alcea [strings]! the Alcea Quartet was formed during a masterclass of the Danel Quartet in the summer of 2012 at the Rurhof domain. 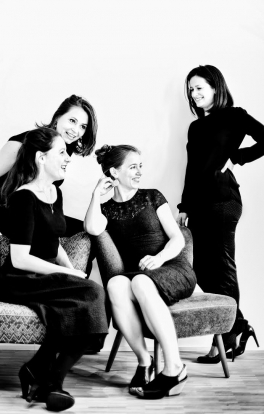 The Alcea Quartet was part of the Festival of Musiq’3 (radio station) in Jun 2013 at Flageyn where they interpreted ‘Der Tod und das Mädchen” of Schubert. The young quartet joined several masterclasses (of the Danel Quartetk the Prazak Quartet, the Talich Quartet, the Artis Quartet a.o.) and were selected for a scholarship at the ProQuaret academy in Paris. In October 2013 the quartet created the chamber opera “Daleko” for string quartet, electronics and vocal soloists of Stéphane Orlando in Brussels. In November 2013 the musicians were invited to join a masterclass by Johannes Meissl (Artis) as part of the Festival ‘Quatuor en Pays de Fayence’, where the quartet also played a concert (first quartet from Beethoven’s Opus 18 and the 7th string quartet of Shostakovitch). In spring 2014 the quartet performed at the Festival l’Europe en Musique in Brussels. BL!NDMAN Alcea [strings] also played music of Toshio Hosokawa in the Concertgebouw Brugge and at the International Chamber Music Festival of Poitou in a project initiated by “Chamber Music for Europe”.